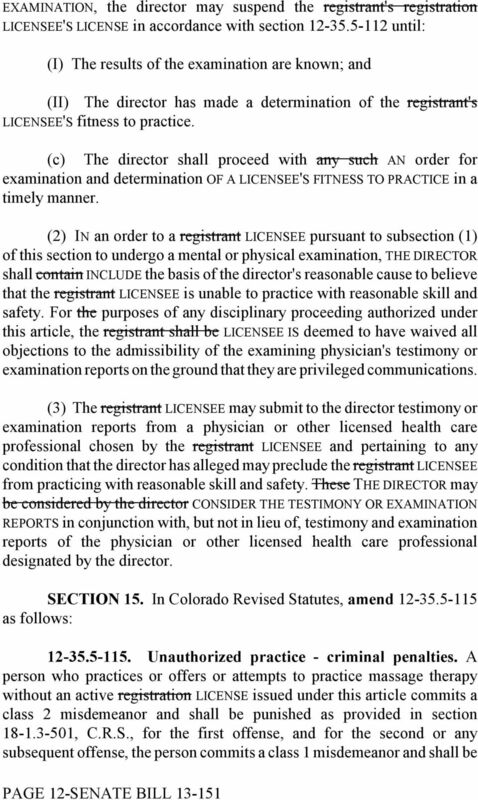 Download "BY SENATOR(S) Nicholson, Aguilar, Guzman, Newell, Tochtrop, Todd; also REPRESENTATIVE(S) Primavera, Fields, Hullinghorst, Labuda, Ryden, Schafer." 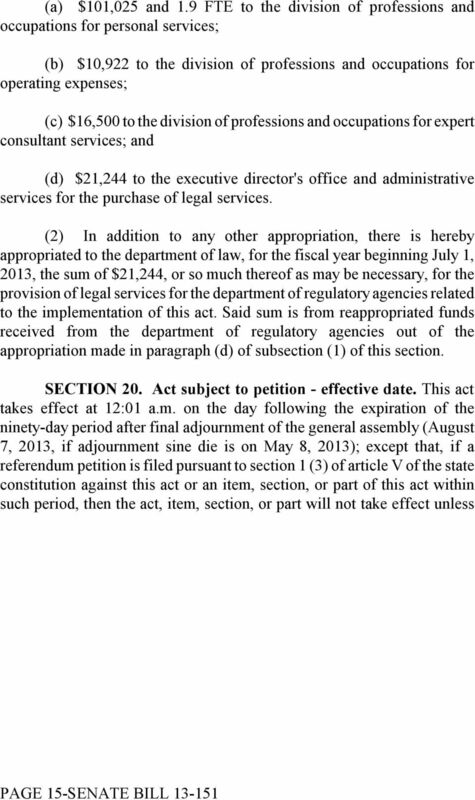 1 NOTE: This bill has been prepared for the signatures of the appropriate legislative officers and the Governor. 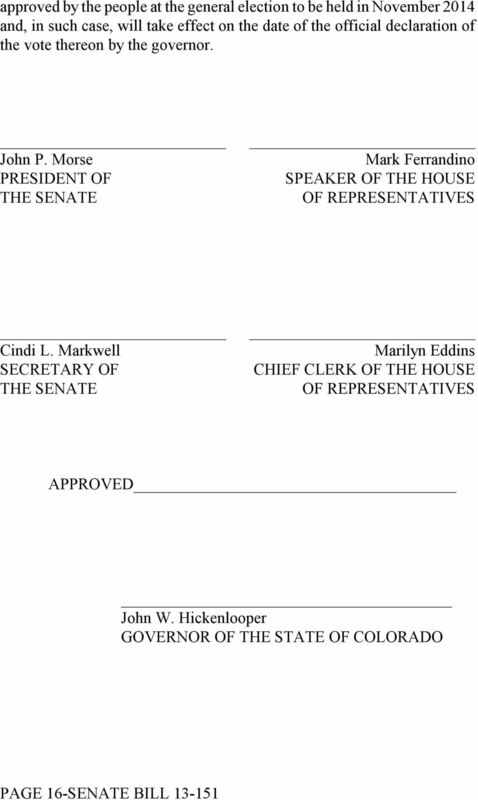 To determine whether the Governor has signed the bill or taken other action on it, please consult the legislative status sheet, the legislative history, or the Session Laws. 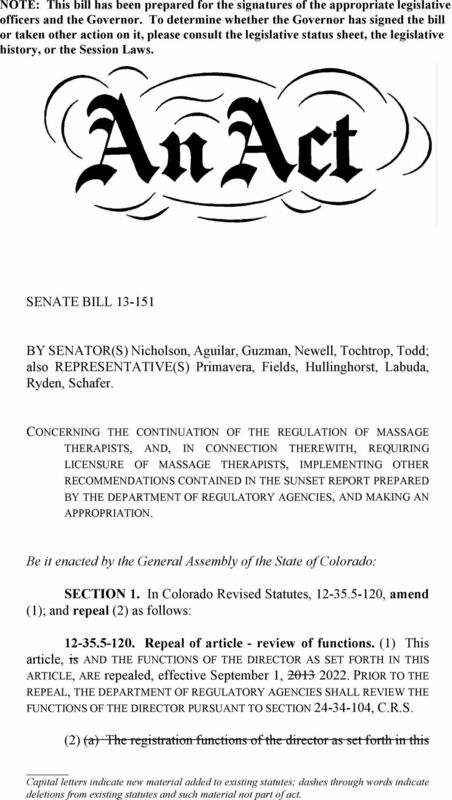 SENATE BILL BY SENATOR(S) Nicholson, Aguilar, Guzman, Newell, Tochtrop, Todd; also REPRESENTATIVE(S) Primavera, Fields, Hullinghorst, Labuda, Ryden, Schafer. 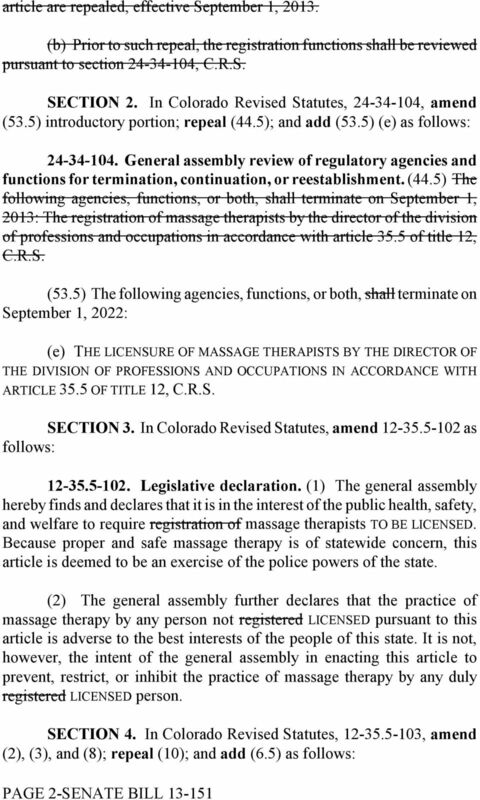 CONCERNING THE CONTINUATION OF THE REGULATION OF MASSAGE THERAPISTS, AND, IN CONNECTION THEREWITH, REQUIRING LICENSURE OF MASSAGE THERAPISTS, IMPLEMENTING OTHER RECOMMENDATIONS CONTAINED IN THE SUNSET REPORT PREPARED BY THE DEPARTMENT OF REGULATORY AGENCIES, AND MAKING AN APPROPRIATION. 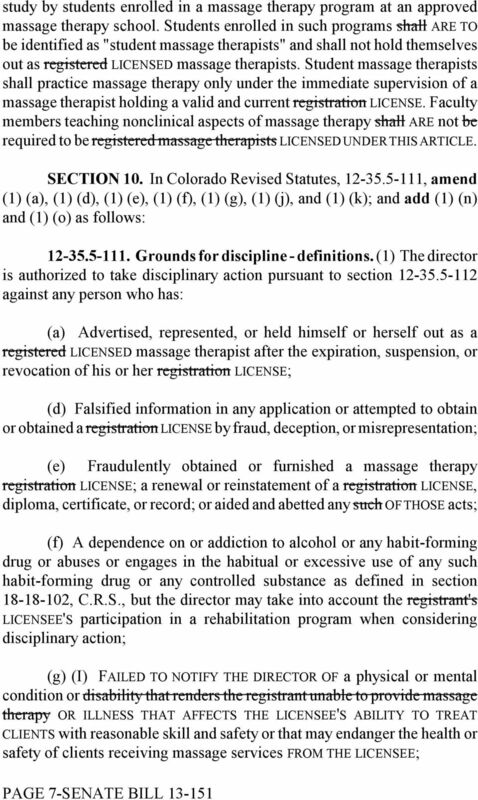 Be it enacted by the General Assembly of the State of Colorado: SECTION 1. 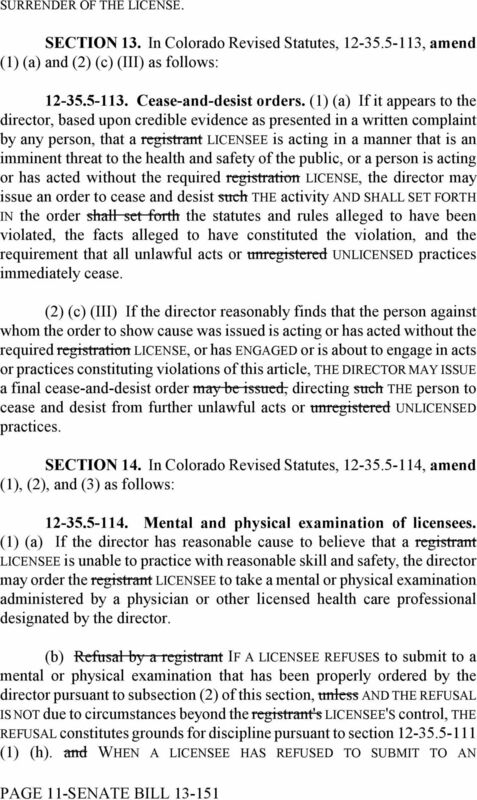 In Colorado Revised Statutes, , amend (1); and repeal (2) as follows: Repeal of article - review of functions. 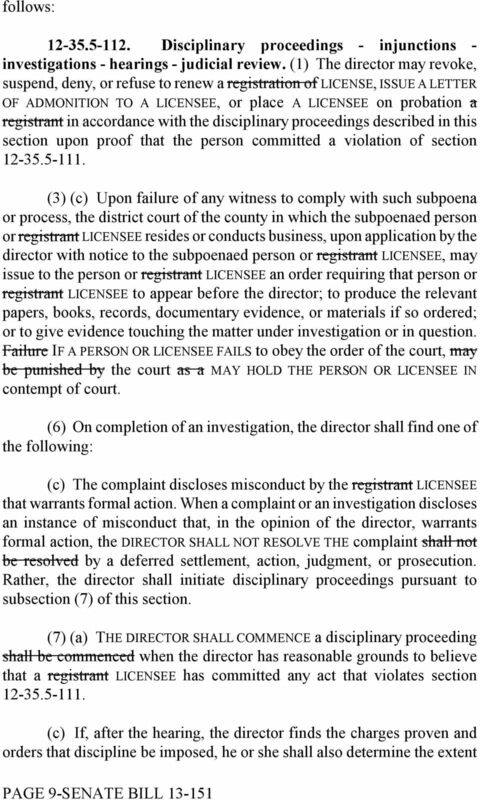 (1) This article, is AND THE FUNCTIONS OF THE DIRECTOR AS SET FORTH IN THIS ARTICLE, ARE repealed, effective September 1, PRIOR TO THE REPEAL, THE DEPARTMENT OF REGULATORY AGENCIES SHALL REVIEW THE FUNCTIONS OF THE DIRECTOR PURSUANT TO SECTION , C.R.S. 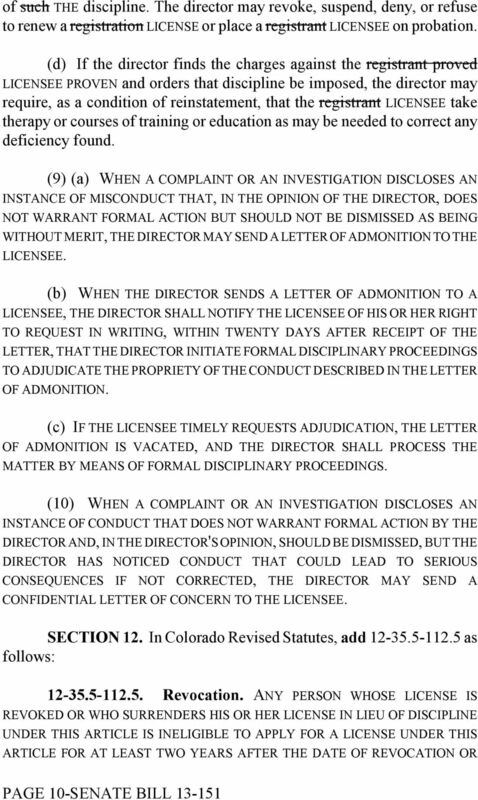 (2) (a) The registration functions of the director as set forth in this Capital letters indicate new material added to existing statutes; dashes through words indicate deletions from existing statutes and such material not part of act. 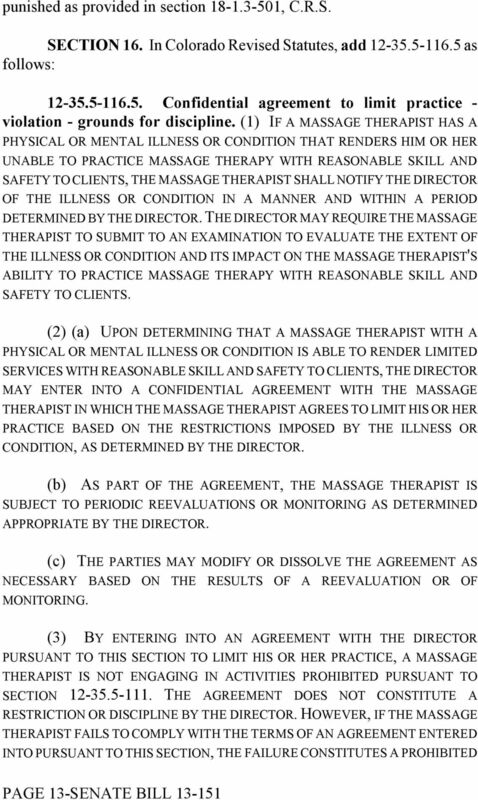 NOTE: The governor signed this measure on 3/22/2013. 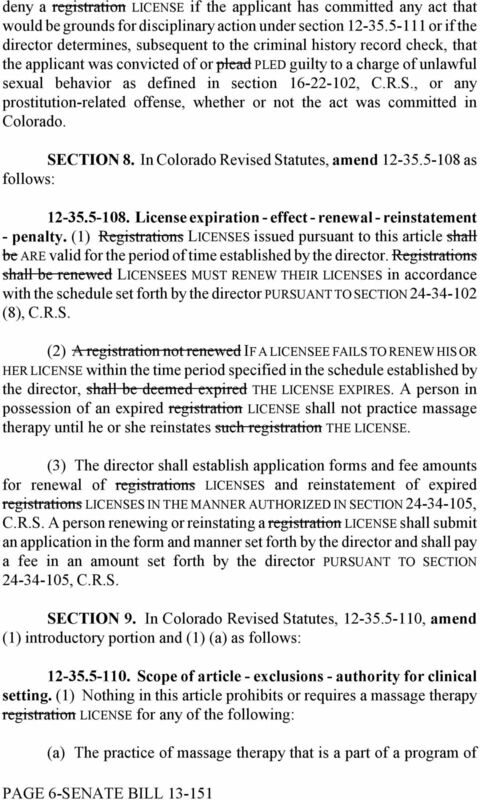 GENERAL ASSEMBLY OF NORTH CAROLINA SESSION S 1 SENATE BILL Short Title: Automotive Repair Licensing (Public) Sponsors: Referred to: Senator Tucker (Primary Sponsor). Rules and Operations of the Senate. 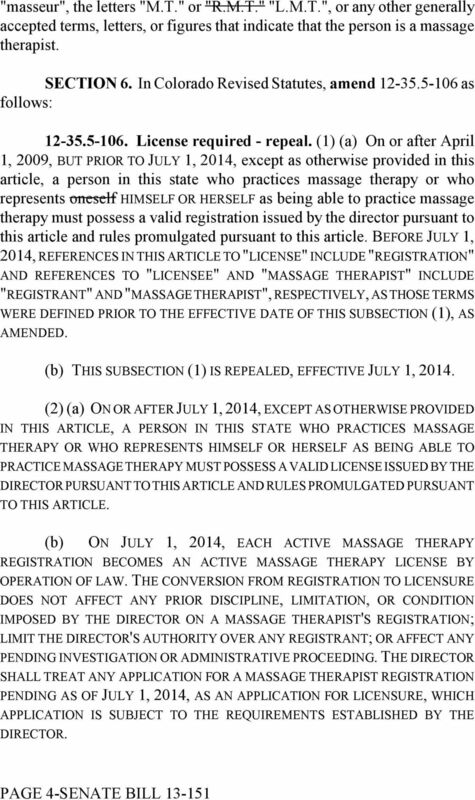 NOTE: The governor signed this measure on 2/27/2014.